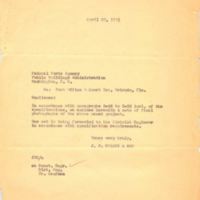 A letter from J. P. Cullen to the Federal Works Agency's (FWA) Public Buildings Administration regarding photos of the construction of the Downtown Post Office. Cullen was the head of J. P. Cullen & Son, the general contractor for the construction of the new Downtown Orlando Post Office building, located at 51 East Jefferson Street. The letter included four sets of photographs to apprise them of the current progress of construction. Original letter from J. P. Cullen to Federal Works Agency Public Buildings Administration, April 30, 1941: Private Collection of Texann Ivy Buck. Digital reproduction of original letter from J. P. Cullen to Federal Works Agency Public Buildings Administration, April 30, 1941. 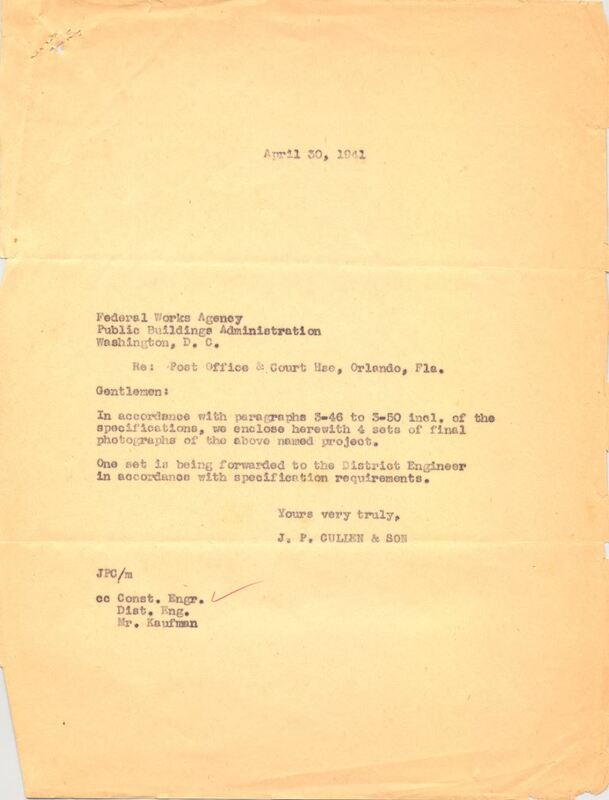 Cullen, J. P.. “Letter from J. P. Cullen to Federal Works Agency Public Buildings Administration (April 30, 1941).” RICHES of Central Florida accessed April 26, 2019, https://richesmi.cah.ucf.edu/omeka/items/show/7604.